Q-Connect Address Label Roll Self Adhesive 89x36mm White (Pack of 250) KF26073 Pack of 1 Q-Connect Self Adhesive Address Labels. 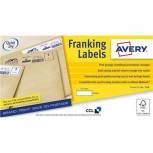 Strong, plain labels that adhere instantly without mess, suitable for addressing envelopes, marking files etc. Supplied in a dispenser style box with perforations between each label. Size: 89x36mm. Q-Connect Address Label Roll Repositionable Self Adhesive 89mmx36mm White (Pack of 200) KF26092 Pack of 1 Q-Connect Self Adhesive Address Labels. Strong, plain labels with peelable adhesive which allows you to reposition your label time after time. Supplied in a dispenser style box with perforations between each label. Size: 89x36mm. Q-Connect Address Label Roll Self Adhesive 102x49mm White (Pack of 180) 0073024 Pack of 1 Q-Connect Adhesive Address Label Roll 102 x 49mm 0073024. Strong and permanent adhesion. 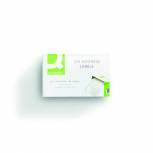 Supplied on a roll in a dispenser style box with perforations between each label. Pack of 180 labels. 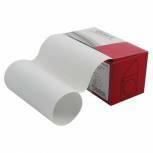 Blick Address Label Roll of 80 80x120mm TD80120 RS221555 Pack of 1 Blick Typist Address Labels. Convenient dispenser packs of labels that feed direct from the pack into a typewriter. Label Size: 80x120mm . 80 labels per pack. Colour - White. 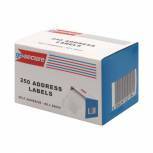 Blick Address Label Roll 50x80mm (Pack of 150) RS221654 Pack of 1 Blick Typist Address Labels. Convenient dispenser packs of labels that feed direct from the pack into a typewriter. Label Size: 50x80mm . 150 labels per pack. Colour - White. 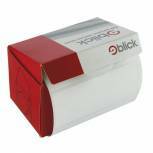 Blick Address Label Roll 36x89mm (Pack of 250) RS222712 Pack of 1 Blick dispenser packs of labels that feed direct from pack into typewriter. Perforated between every label. 36x89mm 150 labels per pack. Q-Connect Address Label Roll Self Adhesive 76x50mm White (Pack of 1500) 9320029 Pack of 1 Q-Connect Adhesive Address Label Roll 76 x 50mm 9320029. Strong and permanent adhesion. 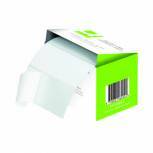 Supplied on a roll in a dispenser style box with perforations between each label. Pack of 1500 labels.